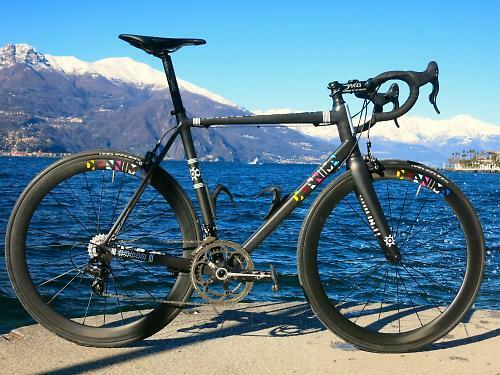 DeAnima Cicli is a new brand that’s handbuilding frames in northern Italy and launching its first bike, the Unblended #1, at Spin LDN this week. We went out to Italy last month to see the bike being made and to ride it up the mountains and around the lakes. We were impressed. DeAnima’s story is an interesting one. 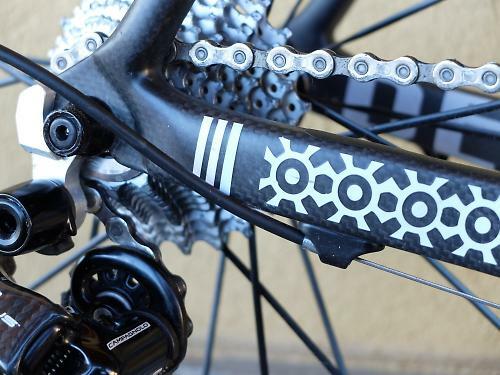 The brand has been set up by Matt Cazzaniga, who used to import Pegoretti bikes into the UK many years ago. 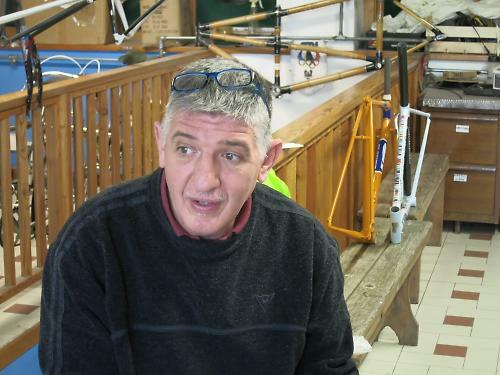 Now he’s working with Gianni Pegoretti to produce the DeAnima bikes. Gianni has been building frames for 25 years, first out of steel with his brother Dario, now from carbon fibre at the San Patrignano framebuilding workshop in Trentino. 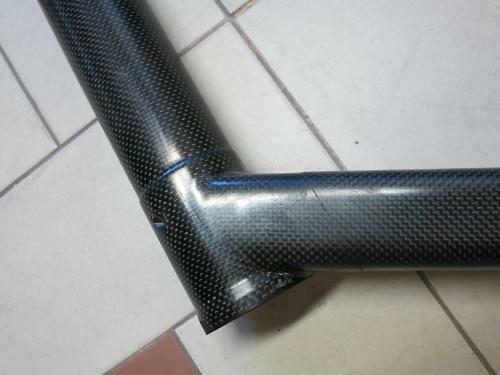 The tubes used for the DeAnima frames are custom-made in Italy from Toray 700 carbon fibre. “Doing the tube design is a lot of work,” says Matt. “You have to get your ideas, work with an engineer, get your moulds made, find someone who can make it… It’s not the easy way of doing it. But this bike is design led. “What we have arrived at has come from years of experience. We’ve found the right balance. We’ve not just got a bunch of tubes out of a catalogue, thrown them together and hoped that what comes out works okay. 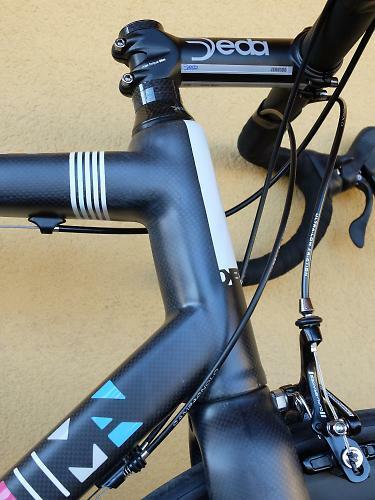 Everything has been studied and every feature of the frame has a function, because what counts is that the bike functions well. So what features have been incorporated into the design? 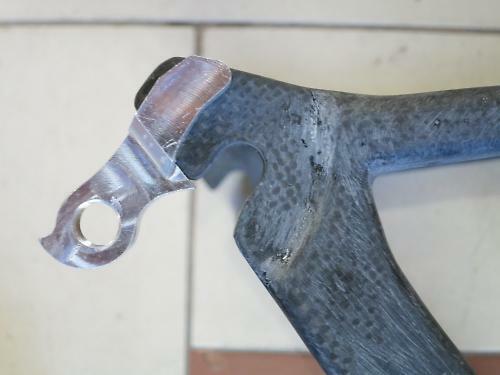 The down tube is produced with the tapered head tube (1 1/8in bearing at the top, 1 1/2in bearing at the bottom) as a single piece for increased stiffness while the bottom bracket and chainstays are another single piece for the same reason. The various frame parts are cut, mitred and glued in the jig – just tacked together, essentially – before going in the oven. Then they’re glued properly before going back in the oven. Then the joints are hand-wrapped with more carbon fibre to add strength before going back in the oven for a third time to be cured. 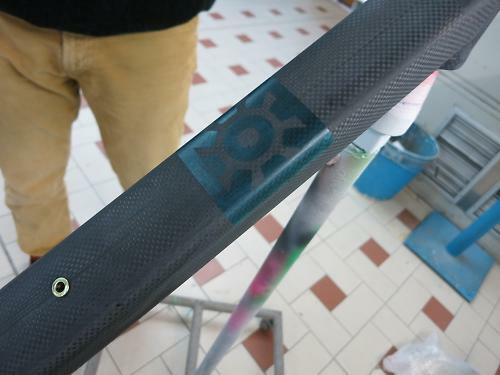 When the frames come out, they get sanded and painted on site using custom stencils and an aerograph. It’s a labour-intensive process. 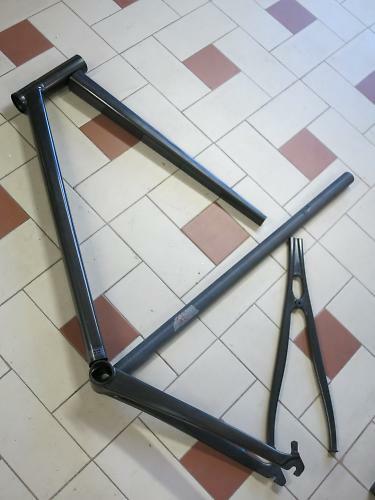 The finished frames, available in sizes from 48cm to 62cm, weigh 850-900g. We went on two rides over the weekend in Italy. On one we headed from Lago di Caldonazzo to Compet, which involved a big climb to over 1,300m and well beyond the snowline, and a switchback-strewn descent back down again. The other ride was about 70 miles taking in the shores of Lake Como and the famous Ghisallo climb. In all, I got over six hours on the bike on a wide variety of different terrains. The DeAnima climbs well. I found that out both on the Ghisallo and on the road to Compet. That second climb is seven miles long which is plenty for any deficiencies in a bike’s climbing prowess to come to light, but I never felt the DeAnima to be in any way sluggish. Quite the opposite; it gets up the slopes with the best of ’em. Get out of the saddle and stick in a little extra power coming out of a hairpin and you get an immediate and generous burst of speed. If you really lay it all on the line and chuck the bike around while sprinting to a summit finish – well, you have to, don’t you? – the DeAnima holds its shape well. 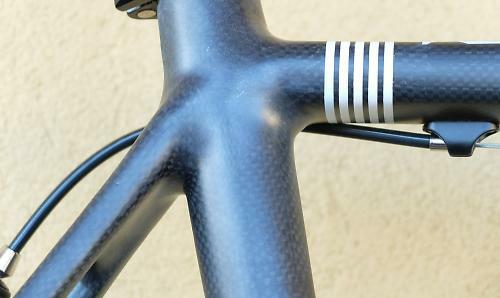 I wouldn’t say this is its strongest feature – other bikes beat it in terms of outright bottom bracket stiffness, for example – but it’s certainly no slouch in this department. The descent from Compet takes you down 900m. It’s not mega-steep but it’s long and there are about a dozen hairpins to negotiate. The direction we came down from La Madonna Del Ghisallo is much straighter so we were able to go faster – well over 50mph. I’d say that the combination of the two makes a good test of a bike’s descending mettle, and the DeAnima felt great throughout. Whether trying to hold a line at high speed while getting buffeted by the wind, or flicking through the turns without dropping too much speed, the DeAnima was remarkably adept at handling the downhills. It felt self-assured and confident, so I did too. When you know exactly how the bike is going to handle, you can forget any ‘just in case’ braking and tear in and out of the bends with the maximum speed. 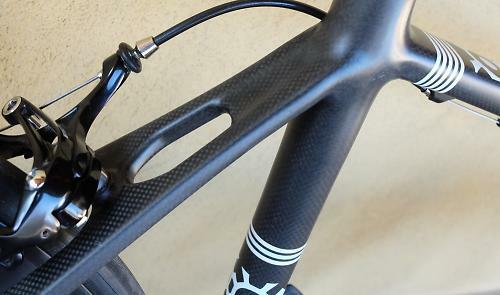 The other feature that comes into play on the descents is the damping. The Italians have plenty of bad road surfaces too, particularly up in the mountains where frost damage can make things bumpy. 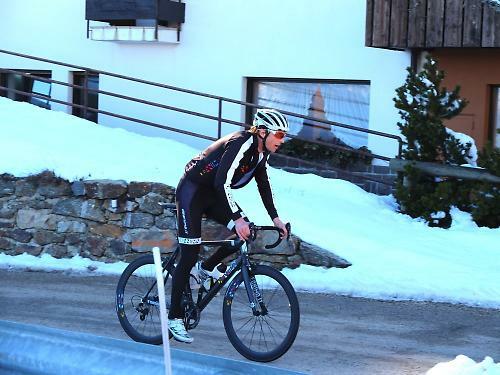 High-frequency buzz can be fatiguing while hitting holes and gravelly bits when you’re heading downhill at 40+mph can make things feel sketchy on some bikes: you can get bucked out of the saddle or you can find it hard to keep hold of the bars. Not here. The DeAnima is very well behaved, soaking up the roughness at both the front and rear well short of the point at which they could become a problem. 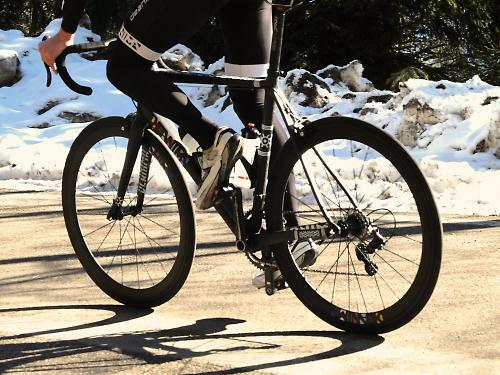 As well as improving the bike’s handling, the small amount of give in the frame also adds to the comfort. The longer of our two rides was, as I said, 70 miles so I can’t tell you how the bike would feel after longer than that in the saddle, but I can tell you that I felt great at the end of that ride without any jarring or aches and pains. In fact, I’d say that the smoothness of the ride is its strongest suit. My overall impression of the DeAnima is that it offers a well-balanced ride without any real weaknesses. It’s light, stiff (not quite super-stiff), responsive and comfortable, and it handles very well indeed. 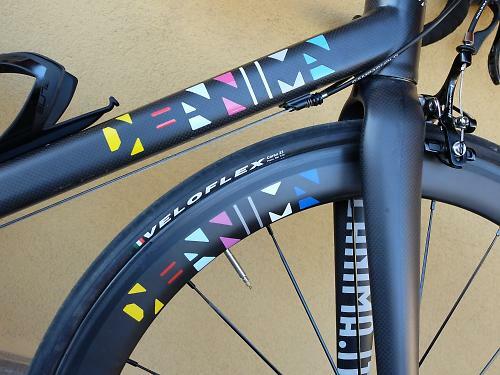 Another plus for many people will be that the DeAnima is handmade in Italy, and because it’s a new brand you’re not going to turn up at your club ride and see a bunch of other people on the same bike. A DeAnima Unblended frameset, including a 3T fork, is priced at £2,250. 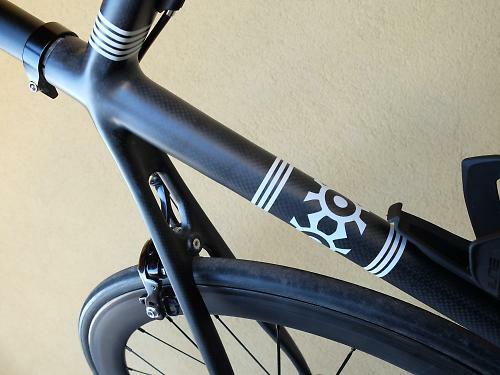 A custom geometry is available at an added cost of €1000. 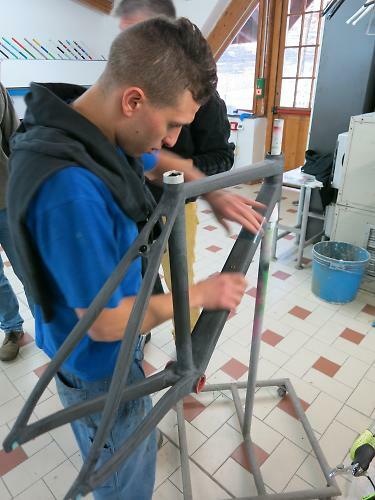 This includes being measured for your frame and requires a visit to the manufacturing facilities in Italy. The price includes all transfers, a night’s hotel accommodation, a guided tour of the manufacturing facility, and a 3-4 hour ride in the mountains around the area. 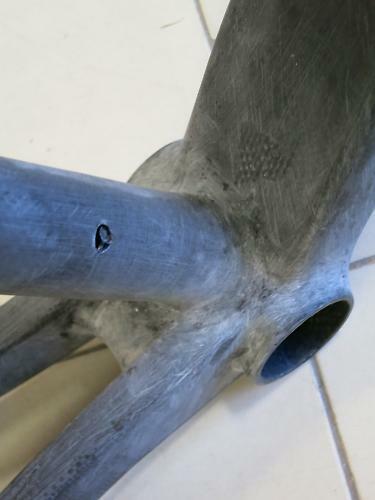 The turnaround time on a custom frame is six weeks. DeAnima is exhibiting at Spin LDN at the Old Truman Brewery, Hanbury Street, just off Brick Lane, London, from Friday until Sunday. For more info go to DeAnima's website. You can follow DeAnima on Twitter.